FILE PHOTO - An oil tanker is docked while oil is pumped into it at the ships terminal of PDVSA's Jose Antonio Anzoategui industrial complex in the state of Anzoategui April 15, 2015. But the OPEC member nation is still fulfilling less than 60 percent of its obligations under supply deals with customers. Venezuela has been pumping oil this year at the lowest rate in three decades after years of underinvestment and a mass exodus of workers. The state-run firm’s collapse has left the country short of cash to fund its embattled socialist government and triggered an economic crisis. The seizures left PDVSA without access to facilities such as Isla refinery in Curacao and BOPEC terminal in Bonaire that accounted for almost a quarter of the company’s oil exports. Conoco’s actions also forced PDVSA to stop shipping oil on its own vessels to terminals in the Caribbean, and then onto refineries worldwide, to avoid the risk the cargoes would be seized in international waters or foreign ports. 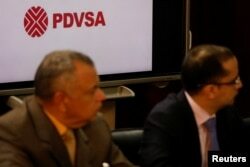 The corporate logo of the state oil company PDVSA is seen as Venezuela's Oil Minister and President of the Venezuelan state oil company PDVSA Manuel Quevedo talks to the media in Caracas, Venezuela, Aug. 7, 2018. The state-run company told some clients in early June it might impose force majeure, a temporary suspension of export contracts, unless they agreed to such ship-to-ship transfers. PDVSA also requested the customers stop sending vessels to its terminals until it could load those that were already clogging Venezuela’s coastline. 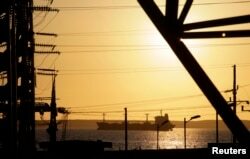 A fuel tanker travels near the Cienfuegos Oil Refinery some 240 kilometres, (150 miles), southeast of Havana, Feb. 7, 2013. The Venezuelan company has used a terminal at the port of Matanzas as a conduit mostly for exporting fuel oil, according to two people familiar with the operations and Thomson Reuters shipping data. Venezuela's fuel oil is burned in some countries to generate electricity. Cupet did not respond to requests for comment. PDVSA has also used ship-to-ship transfers to fulfill an unusual supply contract it has with Cuba’s Cienfuegos refinery. The refinery dates from the 1980s — when Cuba was a close ally of the Soviet Union during the Cold War — and the facility was built to process Russian crude. ConocoPhillips last month ratcheted up its collection efforts by moving to depose officials from Citgo Petroleum, PDVSA’s U.S. refining arm, arguing it had improperly claimed ownership of some PDVSA cargoes. Citgo declined to comment.